When we were in Italy (just a couple of weeks ago for our honeymoon! ), we dedicated a large part of our trip to consuming great amounts of pasta. Fresh homemade pasta was by far our favorite. For Mike's Birthday, we wanted to share some of our Italian favorites with our friends. 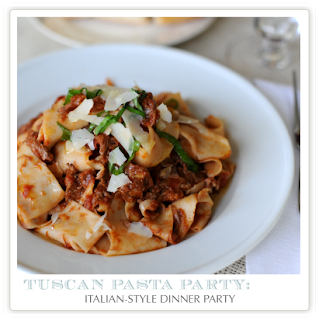 So, we hosted a Tuscan Pasta Dinner Party last weekend. We started the night with two fresh hors d'oeuvres : Grilled Shrimp with Pesto & Cherry Tomato & Green Olive Bruschetta. I prepared grilled italian bread with olive oil to be used with both the shrimp and tomato toppings. We put out our special olive oil we brought back from Tuscany to drizzle over the toasts. I served them on a rustic cutting board on my kitchen counter... after all, Tuscan entertaining is very casual. The recipes for Grilled Shrimp with Pesto & Tomatoes and Olive Bruschettas here. This is the perfect winter's night dinner. It is filling and simple and the truffles make it really special. With just a few ingredients, pasta, olive oil, cream & white truffles - it is perfect for entertaining, too. We became big fans of the Tuscan specialty, Pappardelle al Cinghiale, wild boar braised in red wine and tomatoes served with wide, flat egg noodles. It is another warm-you-to-the-bones great winter dinner. Oh, and if you don't want to make homemade pasta, you can find some great authentic alternatives at most grocery stores - even fettucine will work, but for a special occasion, I recommend the real thing. Pears poached in wine, orange and spices is the perfect light dessert after a two pasta dinner. It is very simple to make, and as a bonus, it makes the house smell fabulous as it sits on the stove. For the table setting, I didn't want it to be 'fancy', but more of a cozy, casual dinner... but it was still Mike's Birthday, so I made it a little special... using 'masculine' touches and colors. I used our Everyday White Plates from William-Sonoma, and brown ticking striped napkins tied with olive green satin ribbon. For the centerpiece, I used lots of candles, sprigs of greenery (snipped from our tree! ), and pine cones. This post is full of great recipes! They all sound fantastic! What a beautiful table setting too. I love your blog! Your menus, recipes and table settings are wonderful. Looking forward to seeing more!